In 1873 the Chicago, Milwaukee, St. Paul, & Pacific Railroad brought Germans "from Russia" to Yankton. (At this time Yankton was the capitol of The Dakota Territory, which was organized in 1861. 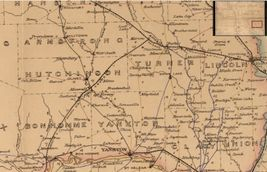 The eastern half of Hutchinson County was called Jayne County until it was abolished in 1871. Armstrong County was then created by the Dakota Territorial Legislature in 1873, taking its territory from northern Hutchinson County. In 1879 it was annexed back into Hutchinson County. South Dakota wouldn't become a state until 1889.) Many settlers came here looking for a better way of life, freedom of religion, and escape from military service. Arriving in Yankton they traveled north to Hutchinson County to claim land. 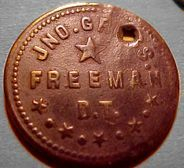 In 1874 a group of immigrants settled 8 miles west of Freeman on the James River, while others settled around the Freeman area. The hard winter of 1874 left the settlers facing starvation in the spring of 1875. The head of one family decided to make the journey to Yankton. His oxen barely survived the winter but there was little choice. Three days later within a few miles from Yankton the ox team gave out. The settler stopped at a farm for lodging and a meal but had no money to pay. The next day the man arrived in Yankton where he searched for flour but found none. About to give up hope he met a German storekeeper named Christian Buechler. Buechler trusted the man; giving him a good supply of flour, groceries, and 50 cents to repay the farmer for lodging. The man soon returned to the settlement and the colony survived. In 1875 a Relief Committee brought 1,000 sacks of flour from Yankton for the needy. Fred Waldner, one of the settlers in the area, filed on his land in 1878. His sod home was located a half block south of the present city park. Fred sold 150 acres of land to John Lawler for $700 and kept 10 acres for himself. Mr. Lawler platted the original town site of Freeman, selling the land to the railroad company for $1500. Mike Tschetter built his sod home near the Bethany Mennonite Church. David Kleinsasser also had a sod home in Freeman. Until the fall of 1879 these were the only 3 houses in Freeman. In the fall the Chicago, Milwaukee, and St. Paul Railway Company extended their line from Hull, IA to Dakota Territory and decided on a station in Freeman. When the railroad came to Freeman, Christian Buechler dismantled his Yankton house and store building, hauled the sections to Freeman on a hayrack, and reconstructed it on the corner of Third and Main street (Schamber store site). The railroad then brought immigrants and supplies for houses and stores. In the 1880's there were only a handful of businesses in town. There was the Schamber store which started in 1882, the Freeman House hotel, John Borman & Co. coal and hides, and Bassett Huntting & Co. which was a grain salt dealer. In 1883 Peter Schempp & Co. started a general merchindise business, John Feiok started a saddle and harness shop, St. Croix Lumber Company run by G.F. Roupe, Jacob Wipf blacksmith shop, John Gross saloon, Bert Hutchinson saloon, and Solon Bevins loans and reality. Freeman Stories "Fact or Fiction?" This website is property of Ben Bengston. © 2013. Information and photos courtesy of: Bernie Koller, Jeremy Waltner, Nancy Schmidt, Norman Hofer, Duke Kleinsasser, Willis Wipf, Reuben Goertz, Freeman Courier, and Heritage Hall Archives. Information is presented as listed in reference material from "History of Freeman" "Freeman Facts-Freeman Fiction" and "Freeman In Print".